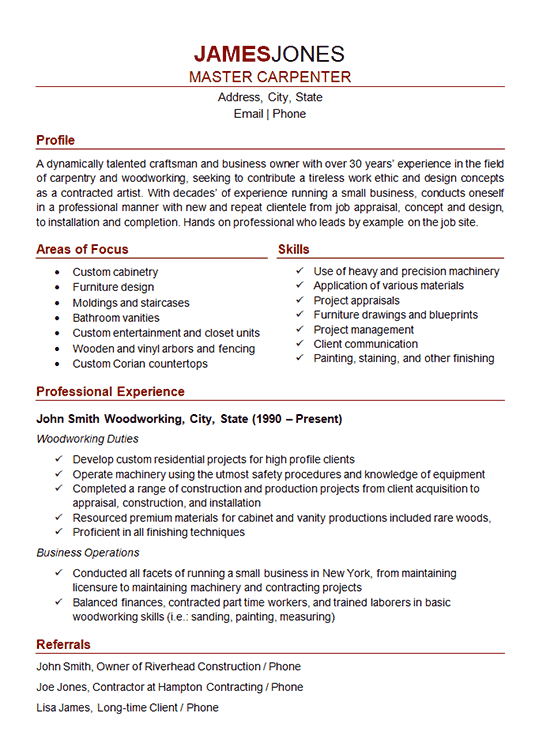 This Carpenter Resume Example is for a skilled master craftsman who has worked for the most elite clients. Having built a client base in one of the highest earning communities in the state, he has proved his expertise and ability through extensive custom projects. A creative mastermind, this candidate is looking to make a professional transition to work for a contractor or similar company providing both leadership and hands on efforts to see projects through to completion. Experience: Custom cabinetry, Furniture design, Moldings, Staircases, Bathroom vanities, Entertainment Closet Units, Arbors, Fencing and Countertops. Client communication; Painting, staining, and other finishing. Develop custom residential projects for high profile clients. Operate machinery using the utmost safety procedures and knowledge of equipment. Completed a range of construction and production projects from client acquisition to appraisal, construction and installation. Resourced premium materials for cabinet and vanity productions included rare woods. Proficient in all finishing techniques. Conducted all facets of running a small business in New York, from maintaining licensure to maintaining machinery and contracting projects.